The very last day that this space will be called Newlyweds:North. At some point on Friday, the new name will launch and I'll have a new brand to call my own. It's hard to believe all that has changed in two years - that I'm even still blogging is a small miracle in my opinion. No longer newlyweds, no longer northerners, instead we're parents and partners. 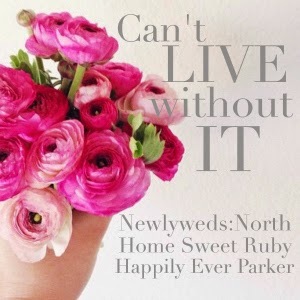 It's really all more than I ever could have imagined when I created the name Newlyweds:North. For our last Throw Back post, I think this story should fit the bill. And for my Can't Live Without It, I think I have to keep it blog related and say that I can't live without my blog designer! I've used Designer Blogs for every single face lift that this baby has seen, including the new name logo which is being finalized as we speak! Their prices are unreal, the designs are classic with a pop of whimsy and their team is super easy to work with. Check out their blog for tips on creating your brand, design ideas and free printables like this beauty. Grab that image above, write a post about something that you cannot live without, link back to me, Cait and Laura and viola! I couldn't even imagine changing my blog. It took so much to get it started and still learning it all. How exciting for you though to start a new look, new name! Thanks for hosting this party. I always look forward to picking my favorite thing to write about for this link up.I actually didn't realize how many things I can't live without. Have a great weekend! I can't wait to find out the new name!! the suspense is killing me....kinda like how we don't know if Maci is leaving Teen Mom or not....Can't wait to see the new look! Can't wait to see your new blog!!! Although I want to say this, I love your current layout, especially the arrows, I hope you keep that aspect in. This makes me want to change my basic, free from Blogger template. They have some amazing stuff. I didn't realize they were so inexpensive! CAN'T WAIT for the new blog title!